President Donald Trump tweeted about the massive fire engulfing Notre Dame Monday, suggesting the use of flying water tankers to douse the flames. A still image taken from a video shows flames and thick smoke billowing from Notre Dame Cathedral in Paris, France, on April 15, 2019. A city hall spokesman said that the area was being cleared, while the fire department said a major operation was under way. "I see no hope for the building", said witness Jacek Poltorak, watching the fire from a fifth-floor balcony two blocks from the southern facade of the cathedral, one of France's most visited places. Notre Dame is a historic cathedral known for its French Gothic architecture. 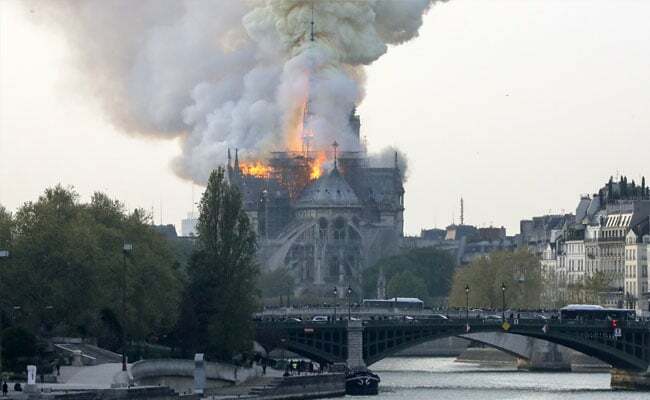 Paris Mayor Anne Hidalgo sent out a message to residents of the city via Twitter: "A bad fire is underway at Notre-Dame Cathedral in Paris". The cathedral is located on the corner of Ile de la Cite, on a spit of land that juts out into the river Seine. He said the threat for severe weather is greatest at such times but that the risk remained even after warm temperatures dropped. Two more deaths have been blamed on the weekend storms that ravaged the South, bringing the death toll to at least eight. French President Emmanuel Macron canceled an address to the nation. Scaffolding on the facade of the building was engulfed in flames as it and the roof of the church started to collapse. The 750-ton spire, a 19th century reproduction of the original Frstructure, collapsed through the roof of the church. Macron was also headed to the scene after postponing a much-anticipated speech on planned policy measures following a long series of violent protests by the Yellow Vest movement that rocked the capital. Construction on Notre-Dame Cathedral began in 1163 and concluded in 1345. The mayor says city officials are in touch with Roman Catholic diocese in Paris. Cybercriminals have compromised a "limited" number of Microsoft email accounts, the software giant has told customers. The unauthorised access to this web mail data was recorded between 1 January 2019 and 28 March 2019.